To coincide with Basel Abbas and Ruanne Abou-Rahme’s multi-media installation, And yet my mask is powerful (2016), in our Eastcastle St. space, the final film in Carroll / Fletcher Onscreen’s short season of Sarah Wood’s films is For Cultural Purposes Only (2009) (courtesy of the Artist and Animate Projects). 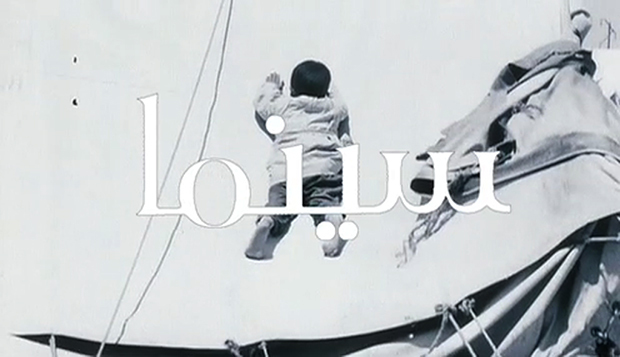 The Palestinian Film Archive contained over 100 films showing the daily life and struggle of the Palestinian people. It was lost in the Israeli siege of Beirut in 1982. 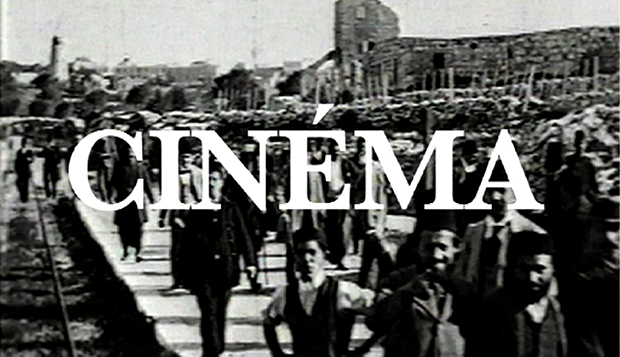 Here interviewees describe from memory key moments from the history of Palestinian cinema. These scenes are drawn and animated. Where film survives, the artist’s impressions are corroborated. 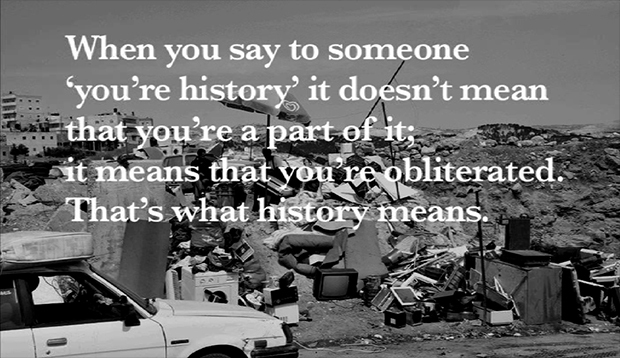 “When you say to someone ‘you’re history’ it doesn’t mean that you’re part of it; it means that you’re obliterated. That’s what history means.” From For Cultural Purposes Only. “‘For cultural purposes only, no commercial value’ is the phrase that is written on customs forms when films prints are sent internationally. The declaration is intended to speed a film’s journey through the customs process. Some time ago, I came across an article that the filmmaker Annemarie Jacir had written about her experience of curating a festival of Palestinian film in New York. In the article she talked about the practicalities of curating, and the difficulties of physically getting material across the world to screen in the US. Films sent from Palestine were simply going missing in transit. One film lost in the post might seem like a mistake but after a little detective work she realised films that she was certain had been sent from Palestine weren’t making it through Israeli customs. She realised that what singled the missing films out was their customs declaration. Instead of being something that facilitated movement, the simple statement ‘for cultural purposes only’ was being read and used as a means of gauging the content of the package and preventing their movement out of the country. I was very struck by this story, not only for the inhibition of the movement of art but also the added layer of meaning that the phrase had gathered. One of the striking things about the conflict between Israel and Palestine is the use of language by both sides to blur understanding and control the narrative of the conflict. I’m thinking, for instance, of the use by Israeli officialdom of ‘targeted killing’ to mean an assassination, or the use of ‘martyr’ by Palestinians to describe the same event. Both are euphemisms, both are used to control the effect of the act. Seeing the phrases ‘for cultural purposes only’ reinterpreted in this conflict made me question how hard it would be to create any art in the context of this double-think… [more here]” Sarah Wood (courtesy Dazed Digital). I’m sitting indoors, looking out of the window at the whited-out world. A sudden snowfall has shocked Britain to a standstill. Everyone’s complaining. Trains don’t work, buses don’t work, things are going wrong. Commentators are scandalized on television as it’s revealed that Britain is running out of salt to grit the roads. More salt will have to be mined! Standstill! Outside the snow world looks still and calm. Sound is muffled by the snow. Outside sounds like a thud. The language of TV panic seems entirely at odds with this stillness. It’s only a few weeks ago since I watched Tzipi Livni announce on TV that Israel was to ‘change the reality’ of Gaza. As suddenly as this snowfall altered Britain, the lives and landscape of Gaza were altered by military action. Reality was ‘changed’. The snow has now nudged Gaza off the headlines. TV landscape has been whited out too.